Start shooting when you see it coming! For Americans, that would have been sometime in the mid to late 1800s at the latest. Then again, the Whiskey Rebellion was something of a problem, as was the “Manifest Destiny” bull crap. I won’t bore you with the hundreds of other national and state violations of the people since the 1790s. So no; it’s always been around, since the dawn of Man, and guns or no guns it isn’t going away without devine intervention. 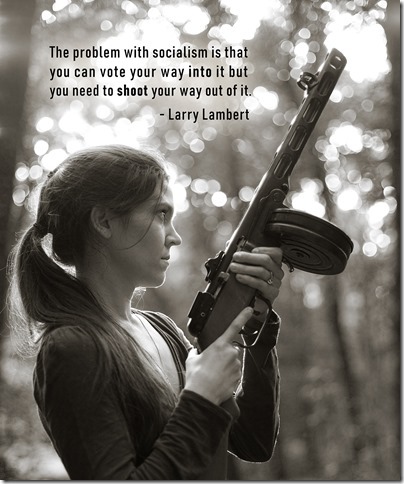 If the constitution were in effect, we wouldn’t have the option of “voting our way into” socialism. It would be illegal. That’s apparently not understood by anyone– You can have democracy, OR you can have a constitution which says that no matter how many people want to steal from you, no matter how many people agree, no matter how many people vote for it, they still don’t get to, no matter what. Constitutional limits are specifically, pointedly, opposed to the tyranny of the majority. Of course the people will get their way no matter how many laws are there to supposedly stop them. As it turns out, an armed criminal can walk right past a “gun free zone” sign too. So the question is; who’s going to stop the socialists (or whatever else they choose to call themselves – it makes no difference)? The constitution won’t jump up and stop them (parchment, it turns out, is not self-aware, nor does it have any motor or sensory functions at all – I wonder how many people know that), so what’s left? What kind of firearm is that in the picture?